A nephew of Rav Joseph B. Soloveitchik, zt”l, Rabbi Meiselman learned Torah on a daily basis with his uncle for more than a decade. Rabbi Meiselman has just finished writing a book (as yet untitled) on Torah and science due to be published in the next few months. 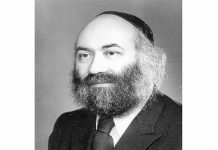 Klal Yisrael lost a premier mechanech this past erev Rosh Hashanahwith the sudden passing of Rabbi Pesach Oratz, z"l. Rabbi Oratz's career in Jewish education spanned close to six decades, over which time he taught tens of thousands of students. One of the things that made Rabbi Oratz unique was the range of topics and of students that he taught. The German advance was so rapid that within a short time they found themselves prisoners in the Stolpce ghetto. “The fear of being exposed publicly is the only thing that will stop people,” observed Seewald. I had no idea what Down syndrome is and I was happy that I'd have a little sister. In short, Michael Lerner is neither Orthodox nor a Rabbi. We DO know that he is an anti-Semite though, one who claims that Jews themselves are to blame for anti-Semitism! Shomrim, volunteer citizen patrols, established in Jewish communities to handle quality-of-life issues, have been in existence for many years and are credited by local police forces for their key role in reducing crime. Not only are there active Shomrim patrols in Brooklyn's religiously concentrated neighborhoods of Boro Park, Flatbush, Williamsburg and Crown Heights, but also thriving patrols in the Jewish communities of Baltimore, Northwest London and more. While these patrols are designed to monitor suspicious activity and report any potentially dangerous activity to the police, the recent shooting of four Boro Park Shomrim members in September is a chilling reminder of the inherent danger these dedicated volunteers face on a daily basis. As a teen, I found essays by people like William F. Buckley Jr. and Lewis Thomas enthralling. To his parents’ friends, he was “Mrs. Greenberg’s disgrace,” but to sports fans he is one of the greatest – if not the greatest – Jewish baseball players of all time. Long before Sandy Koufax, Hank Greenberg excited Jewish sports fans with his prowess on the baseball diamond. Johannes Reuchlin, renaissance scholar and savior of seminal works in Jewish thought and theology. Could Americans In Israel Elect The Next President? A grassroots, Israeli-based voter registration organization maintains that eligible American voters in the Jewish state could significantly impact the results of next Tuesday's race for the White House. Reuven Poupko wears many hats, aside from a fur-clad shtreimel. A rabbi, lawyer and psychologist, the Baltimore native also served as chief rabbi of Curacao from 1998-2001, and has taught in colleges, rabbinical seminaries and day schools. But this Thanksgiving, Poupko is going to swap his bekeshe for an apron as he takes his wife and children to the streets of downtown Baltimore to share a Thanksgiving dinner with some of the city's most downtrodden residents. Tzipi Hotovely, 30, is the youngest member of Knesset and a rising star in the Likud party. She grew up in Rechovot and earned B.A. and M.A. degrees from Bar Ilan University, where she served as editor of the Law Review. From December 2002 to January 2009, Elliott Abrams was an insider. As deputy assistant to the president and later deputy national security adviser – with the Middle East as his focus – Abrams interacted daily with such figures as President George W. Bush, Secretary of State Condoleezza Rice, and Israeli Prime Ministers Ariel Sharon and Ehud Olmert. We take a whole person approach, giving our people assistance with whatever they need. The Trump administration is waiting to hear our suggestions. They are looking to us to be proactive and speak out about what we would like. Sixty-five years ago next month - on August 11, 1945 - Polish-born Holocaust survivor Larry Wenig vowed to utilize all of his talents toward creating a Jewish state in Palestine. He held no public office. Indeed, he rarely left his room. Yet the Vilna Gaon, remains one of modern Jewry's most influential figures. Like other chassidic dynasties, Bobov was not immune to one day experiencing a schism. When Rabbi Naftali Zvi Halberstam, the fourth Bobover Rebbe, died in 2005, a dispute arose over who would succeed him. Some chassidim sought to appoint his younger half-brother, Rabbi Ben Zion Aryeh Leibish Halberstam, as the next rebbe; and others sought out the fourth rebbe’s sons-in-law: Rabbi Mordechai Dovid Unger as the rebbe, and Rabbi Yehoshua Rubin as the Bobov rav (serving as head of the bet din and as the posek). Former EU MP Paulo Casaca claimed that there are a number of striking parallels between the 1979 Iranian Revolution, the 1917 Bolshevik Revolution and Hitler becoming Chancellor of Germany in 1933. The New York State comptroller manages the state’s $180.7 billion pension fund, audits the spending practices of all state agencies and local governments, oversees the New York State and Local Retirement System, reviews the New York State and City budgets, and approves billions in State contracts and spending.